You can join these workshops to learn and improve your painting technics. 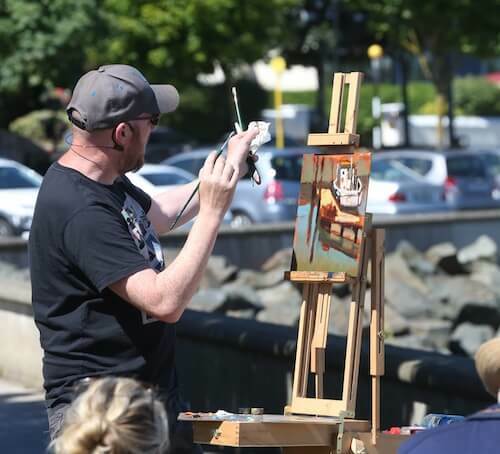 This year as every year, we have some masters of their art and our plein air artists will share their tips of the trade with you during the workshops. 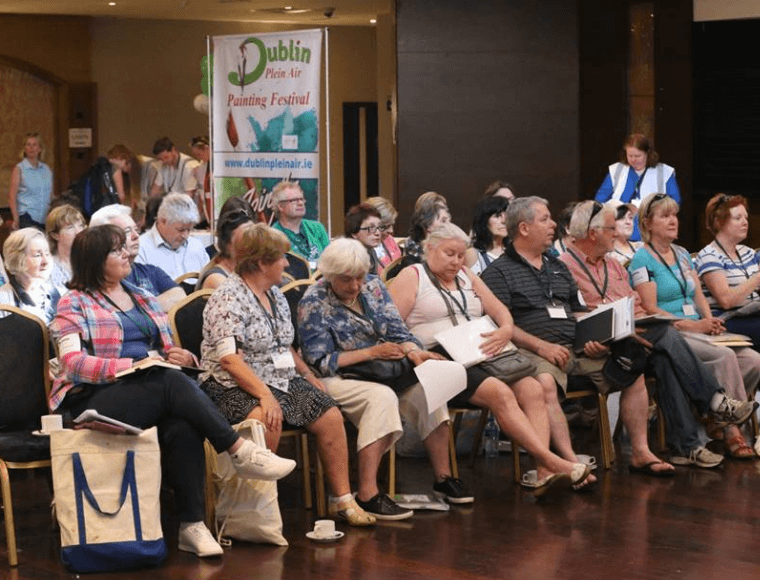 Please Note – You must have already paid the Artist Registration or pay it now (65 euro) before you can join any workshops etc. Times and dates for workshops may change due to unforeseen circumstances. Una Sealy RHA is an Irish artist based in Fingal, County Dublin. She paints domestic interiors, streetscape, landscape and portraiture. She paints from observation and often the compositions evolve organically, with elements appearing and disappearing before the final arrangement is arrived at. The works form a kind of visual autobiography. Paul will discuss equipment and the best way to approach working out doors. The talk which is free to attend is aimed at those people who are new to painting outdoors (en plein air). Any registered artist may attend. A Polish born artist based in Ireland, Kate Kos’s watercolor paintings can be described as bold and fresh. For all those artist who wish to capture the beauty of painting plein air in watercolour , this is one workshop you should not miss. Dave West is gifted across a number of media, his pastels are recognised internationally and his plein air oil paintings tempting the visual senses with the atmosphere he creates in his work. He has been teaching for many years in both mediums. Dave was born in Wales and is now settled North County Dublin. He studied at the Carmarthenshire College of Art & Design. His solo exhibitions including ‘Nocturama’ at Draiocht Arts Centre, ‘Spectral’ at the Leinster Gallery and 2 with the Blue Leaf Gallery. He has exhibited widely in Group Shows including the Royal Hibernian Academy, Royal Ulster Academy and Eígse, and in the UK with the Royal West of England Academy, Royal Society of Oil Painters, Royal Society of Marine Artists, The New English Art Club, The Royal Society of British Artists, and the UK Pastel Society, at which he won the 2013 Schminke Award. In 1991 he was Artist in Residence at the Tyrone Guthrie Centre . Neal has been awarded residencies namely The Vermont Studio Centre Fellowship in Vermont USA , Ballinglen Fellowship, O’Reardon House Fogo Island Newfoundland , Invited Artist with Ontario Art Society Field Trip, Cill Raillig Art Studios. Blaise Smith has painted outdoors for many years and is known for his focus on the vernacular sheds and farmyards of the Irish country side. His paintings, up to eight feet wide, are painted on the spot over months and years and many are now in national collections such as the OPW and various County Councils. 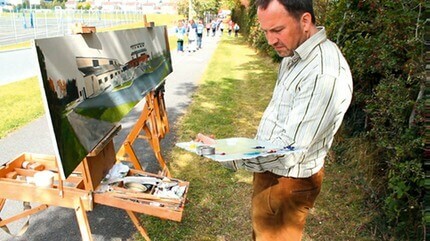 He recently completed a five metre (16 foot) wide panorama of Waterford City which now hangs in the City & County Hall. He also really enjoys the challenge of painting small landscapes in one sitting. He is an elected member of the Royal Hibernian Academy and teaches at the RHA drawing School where he is Vice Principal. There are three prizes awarded to participating artists. Please Note – You must have already paid the Artist Registration or pay it now before you can join any workshops etc.